I am happy to announce that I am the Guest Editor, along with Phil Ainslie and Niels Secher, of a Research Topic titled “Cerebral oxygenation in health and disease states“. This great opportunity will permit to bring together the leaders in cerebrovascular physiology around this exciting topic. Are you interested in contributing to our Research Topic ? You are welcome to send us an abstract/outline of work related to cerebral oxygenation (no longer than one page) by clicking on the “Submit Abstract” link on this page. Authors will then be notified by the host editors whether their abstract/outline has been accepted. If accepted, authors will have the possibility to submit their manuscript online. You can find more information regarding our Research Topic and instructions for authors HERE. 122- Sympathetic regulation of cerebral blood flow in humans: a review – Ter Laan et al. 123- Changes in cerebral tissue oxygen saturation during anaesthetic-induced hypotension: an interpretation based on neurovascular coupling and cerebral autoregulation – Meng et al. 115- The effects of hypertension on the cerebral circulation – Pires et al. 116- Assessment of cerebral oxygenation oscillations in subjects with hypertension – Li et al. 117- Cerebral oxygenation during hyperoxia-induced increase in exercise tolerance for untrained men – Oussaidene et al. 118- Cerebral vasomotor reactivity during hypo- and hypercapnia in sedentary elderly and Masters athletes – Zhu et al. 119- Reliability, asymmetry, and age influence on dynamic cerebral autoregulation measured by spontaneous fluctuations of blood pressure and cerebral blood flow velocities in healthy individuals – Ortega-Gutierrez et al. 120- Near-infrared spectroscopy can predict the onset of cerebral hyperperfusion syndrome after carotid endarterectomy – Pennekamp et al. 121- Cerebrovascular responses to orthostatic stress after spinal cord injury – Sahota et al. I have been interested in the impact of vasopressors on brain blood flow and oxygenation since a couple of years now. You can read a post related to previous work here, and pieces related this issue here and here. Accumulating evidence, published by independent research teams, suggests that the utilization of some vasopressor agents can be associated with a reduction in brain oxygenation monitored by near-infrared spectroscopy. However, the picture isn’t that perfect because other research teams have published the opposite. In upcoming posts, I will discuss results related to that very exciting research area. I will begin with a small correspondence published last year in the British Journal of Anaesthesia. In this study, phenylephrine (50–100 mg; n=4) and ephedrine (5–10 mg; n=7) were administered in patients undergoing carotid endarterectomy under general anesthesia, in order to correct hypotension (corresponding to a 20% reduction in mean arterial pressure (MAP) vs. preoperative MAP before cross-clamping). MAP, middle cerebral artery flow velocity (MCAVmean; transcranial Doppler) and cerebral oxygenation (near-infrared spectroscopy) were monitored. The figure below shows the main results of this study. MAP augmented with both vasopressor agents. Following administration of ephedrine, MCAVmean stayed constant and cerebral oxygenation (rSO2) increased. However, MCAVmean increased while cerebral oxygenation decreased following the administration of phenylephrine. Of interest, heart rate raised with ephedrine and dropped with phenylephrine. 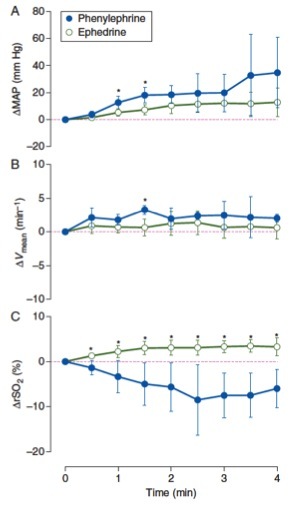 The authors suggest that this reduction in cerebral oxygenation with phenylephrine may be explained by 1) a change (decrease) in cardiac output following administration of this vasopressor or 2) a direct alpha-receptor-mediated cerebral vasoconstriction. Although the data are very limited, the observations were consistent, since no patients treated with phenylephrine showed an increase in cerebral oxygenation, and no patient in the ephedrine group showed a decrease. Pennekamp CW, Immink RV, Moll FL, Buhre WF, de Borst GJ. Differential effect of phenylephrine and ephedrine on cerebral haemodynamics before carotid cross-clamping during carotid endarterectomy. Br J Anaesth 2012 109(5):831-3. doi: 10.1093/bja/aes370. 111- Acute volume expansion attenuates hyperthermia-induced reductions in cerebral perfusion during simulated hemorrhage – Schlader et al. 112- Cerebral oxygenation in the beach chair position: a prospective study on the effect of general anesthesia compared with regional anesthesia and sedation – Koh et al. 113- Impact of sevoflurane anesthesia on cerebral blood flow in children younger than 2 years – Rhondali et al. 106- Does stroke subtype and measurement technique influence estimation of cerebral autoregulation in acute ischaemic stroke – Saeed et al. 107- Continuous cerebrovascular reactivity monitoring and autoregulation monitoring identify similar lower limits of autoregulation in patients undergoing cardiopulmonary bypass – Blaine Easley et al. 108- Effect of dehydration on cerebrovascular control during standing after heavy resistance exercise – Moralez et al. 110- Middle cerebral oxygen delivery during the modified oxford maneuver increases with sodium nitroprusside and decreases during phenylephrine – Stewart et al.